Do you have multiple property managers in your office? One that handles properties A, B, and C, while a separate individual or group manages properties X, Y, and Z? We have some great news to share! We’ve deployed two great new features which will help you out! Manager Info. 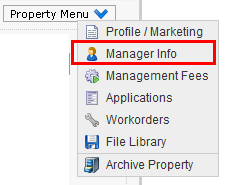 You can now specify different manager info on a per-property or per-unit basis. This means the invoices and statements going out to tenants can have different reply names and addresses. This is especially useful if the payments from tenants need to come in to different name (the property owner’s name perhaps) or to a different addresses. To use this, edit your properties, and from the property menu select Manager Info as displayed to the right. If no manager info is specified, the system will always use your default contact info found at Settings, Your Contact Info. As of June 24th, this feature has been updated. Please see the latest blog post for more details. Multiple Undeposited Accounts Support.Head on over to your Accounts tab, and you can now create an additional undeposited funds account. In fact, you can have as many as you would like. Just add a new account as you normally would, and select Undeposited Funds from the dropdown account type menu. The use case for this would be if you have multiple property managers all receiving funds for separate properties or accounts. Each property manager can now have a unique undeposited funds account so funds don’t get mixed up between managers. Now you can head over to Settings, Manage User Accounts, and you can edit the permissions for your managers so they only have access to their own undeposited funds account and cannot see others.Another use case: If your policy or regulations dictate that you keep incoming funds for different properties or owners completely separate, you can now do this by setting up a unique undeposited funds account and unique bank account for each property.